The Primo Jr is a 4×4 TLR camera made by Tōkyō Kōgaku (maker of the Topcon cameras) in 1958–60. It was available in various configurations — metered, unmetered, grey-finished, and rebadged as the Sawyer's Mark IV for the Sawyer's company in Portland, Oregon. The Primo Jr itself was distributed in Japan by Ōsawa Shōkai, owner of the Primo brand, and in the US by Beseler. The Primo Jr was made during the brief 4×4 camera boom of the late 1950s. It was released one year after the 1957 Rolleiflex Baby Grey, and was the first Japanese 4×4 TLRs, beating the Yashica-44 by a small margin: both models were announced in magazines dated May 1958 but the Primo Jr was advertised the same month whereas the Yashica was advertised from July. Among 4×4 "superslide" TLR cameras, the Primo Jr was lauded for the bright viewfinder, and the sharp Topcor 60 f/2.8 taking lens. Other features include pop-up sports finder and magnifier, crank wind instead of dial wind (a luxury feature in 4×4 TLRs of those days), bright Toko 60 f/2.8 viewing lens, solid build and luxury finish. It is comparable in quality to the 4×4 Rolleiflex. The Primo Jr has the classical TLR shape. The front standard moves back and forth for focusing. The focus knob is on the photographer's left; it contains a film reminder and has a distance scale engraved in metres or in feet and depth-of-field indications. The camera focuses down to 0.65 metre or 2.2 feet, which is quite close compared to its competitors. It seems that the cameras engraved in metres have a film reminder in DIN and those engraved in feet have a film reminder in ASA. The film is advanced by a crank on the photographer's right, and the shutter is wound at the same time. There is a round exposure counter window on the same side, near the strap lug. The exposure counter is activated by a button sliding to the rear, placed above the advance crank and protected by a smaller lock button. The advance crank may jam due to improper activation of the exposure counter while there is no film in the camera; in that case the instruction manual recommends to open the back and manually turn the film-sensing wheel until the exposure counter is freed again, then to press the release button. The position of the first exposure is set via a red window at the bottom of the back, protected by a vertically sliding cover. The L-shaped back is locked by a large knob surrounding the tripod thread, with O and C indications. The viewing hood contains a sportsfinder and a large magnifying lens. The viewing screen has parallax indications and a Fresnel lens, called "Toko Bright" in the advertisements. The unmetered model has a regular nameplate, with PRIMO–JR and the serial number. Primo Jr no.361410, Topcor 6cm f/2.8 taking lens no.360581, Toko 6cm f/2.8 viewing lens no.360410, Seikosha-SLV shutter, no meter. Topcor 6cm f/2.8 taking lens, Seikosha-MXL shutter. The Primo Jr has a Seikosha-MXL or Seikosha-SLV shutter (B, 1–500), and the aperture range goes from 2.8 to 22. The release button is at the bottom of the front standard and has a thread for a cable release, as well as a lock to prevent accidental shutter firing; there is a PC synch socket on the opposite side and the camera has no self-timer. The shutter speed is set by a lever placed next to the taking lens, on the photographer's right. The user manual recommends not to switch to 1/500 when the shutter is cocked. There is a Light Value scale going from 3 to 18 on the opposite side, inscribed on a plate surrounding the taking lens and rotating together with the speed lever. Shutter speed and aperture are interlinked mechanically so that once one sets the proper Light Value, moving the shutter lever will automatically adjust the aperture and retain the same total exposure. For example, if one were to set the camera to 1/50 at f/11 and then move the shutter dial to 1/100, the camera will automatically change the aperture to f/8 and so on. The speed and aperture both appear in a window placed above the viewing lens, visible by the photographer in the normal picture-taking position. The aperture can be set by using the left-hand lever and looking at this window, without using the Light-Value system. The taking lens is a four-element Topcor 6cm f/2.8, and the viewing lens is a Toko 6cm f/2.8 triplet. They have bayonet attachments for filters and a hood. The hinged lens cap is inscribed PRIMO or SAWYER'S in front of the viewing lens, and has a protruding part at the bottom protecting the shutter release. The camera has no built-in accessory shoe, but an auxiliary shoe can be attached to the internal bayonet of the viewing lens. Primo Jr case, box and user manual. Primo Jr no.284494, Topcor 6cm f/2.8 taking lens no.283959, Toko 6cm f/2.8 viewing lens no.282483, Seikosha-MXL shutter, no meter. This example has TOKYO OPTICAL CO. on the Light-Value scale and inside the back, and JAPAN on the tripod socket. The meterless Primo Jr was announced in Japanese camera magazines dated May and June 1958, and Japanese advertisements are reported from May 1958 to June 1960. The first production version has a Seikosha-MXL shutter. The advertisement in the May 1959 issue of Asahi Camera, placed by the distributor Ōsawa Shōkai, lists this model as the "44 Primo JR" (44プリモJR), at the price of ¥19,500 (case included), along with the Primo Look projector for 4×4cm and 35mm slides. The Primo Jr was distributed in the US by Beseler, and the price in 1959 was $69.95. In late 1959, the Primo Jr was offered for free to any buyer of a Beseler B Topcon (costing $295.00), as part of a promotional offer ending on 15 January 1960. The examples with Seikosha-MXL shutter have an M/F/X selector under the taking lens, for electronic flash or different types of flash bulbs. The shutter name SEIKOSHA–MXL is inscribed on the black plate with the Light Value scale. This plate also has the company name, either TOKYO KOGAKU or TOKYO OPTICAL CO. (see below). The inside of the back is inscribed TOKYO OPTICAL CO. on some examples, but not all. The early cameras have TOKYO KOGAKU on the Light-Value scale, Tokyo Kogaku on both lens rims and no logo on the viewing hood. They also have MADE IN JAPAN below the focus knob. Later cameras have TOKYO OPTICAL CO. and no company name on the lens rims. They also have the word JAPAN on the tripod socket, instead of MADE IN JAPAN under the focus knob, and the film reminder now has red and white engravings and a higher sensitivity range. Most cameras have a round TKK TOKO logo on the viewing hood, but at least some are known without this logo. One source mentions that some examples have brownish instead of black depth-of-field and Light-Value scales, but this might be caused by wear. Minor changes are reported in the anti-reflection baffles of the exposure chamber. Towards the end of the production, the pressure plate for the supply spool was replaced by a roller. Primo Jr no.276xxx, grey edition, Seikosha-MXL shutter. The meterless Primo Jr with Seikosha-MXL also exists in a grey edition, probably made for the Japanese market only. The main body, viewing hood, front standard, nameplate and back are painted light grey, and the base of the viewing hood has a hammertone paint of a different shade of grey. The sideplates, back, front standard and film flange are covered with light grey leatherette. The distance scale and the Light-Value scale are silver and the depth-of-field scale is light grey, all with black markings. The grey edition comes with an assorted grey lens cap and lens hood. It has been observed with a rigid grey ever-ready case, probably specific to the grey Primo Jr. The grey edition of the Primo Jr is pictured in the May 1959 advertisement in Asahi Camera cited above, even if the graphical design of the advertisement does not make this obvious. Sawyer's Mark IV, SAWYER'S JAPAN, LTD. marking, original box. The Sawyer's Mark IV is a rebadged version of the meterless Primo Jr with Seikosha-MXL. The nameplate reads SAWYER'S MARK IV and the viewing hood has a round SAWYER'S IV logo. Most examples have SAWYER'S JAPAN, LTD. on the Light-Value scale, but some have TOKYO OPTICAL CO. instead. It seems that all the cameras have TOKYO OPTICAL CO. inside the back. 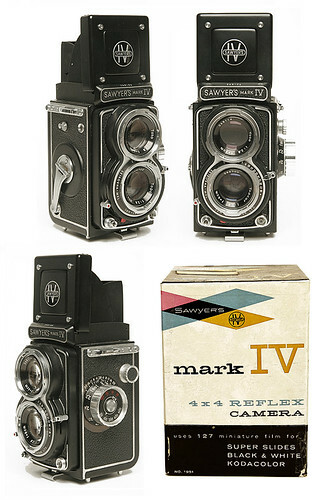 The Sawyer's Mark IV probably all have the distance scale in feet and the film reminder in ASA. The Sawyer's Mark IV was distributed by Sawyer's Inc., Portland. It is not known if the name Sawyer's Japan Ltd. inscribed on the camera and repeated on the user manual effectively corresponds to a Japanese sub-company of Sawyer's or is merely a dummy name for Tōkyō Kōgaku. Sawyer's Mark IV, SAWYER'S JAPAN, LTD. marking, case, cap and user manual. Metered Primo Jr no.253371, Seikosha-MXL shutter. The metered Primo Jr was announced in a column of the March 1960 issue of Shashin Salon, about the 1960 Japan Camera Show; it was later featured in other magazines dated June and July and was advertised from July to October. In the July advertisement in Asahi Camera, the camera is called "44 Primo JR", the same as in the May 1959 advertisement, the shutter is mentioned as a Seikosha-MXL and the price is unchanged at ¥19,500 (case included). The exposure meter takes the place of the nameplate; the selenium cell is to the photographer's left and the galvanometer is on the opposite side. The meter needle is above the galvanometer and the ASA setting is at the front, with the words ASA INDEX inscribed in red. There is a small PRIMO–JR nameplate below the ASA setting, and the serial number is engraved behind the galvanometer. All the examples of the metered Primo Jr known so far have the Seikosha-MXL shutter, the TOKYO OPTICAL CO. engraving and the logo on the viewing hood. The meterless Primo Jr was modified at some time. The late Primo Jr has a Seikosha-SLV shutter and other minor changes. The new shutter still has the Light-Value system connecting the speed and aperture. The red M/F/X selector of the previous models is replaced by a silver M/X selector, placed just below the Light-Value setting lever. The new shutter reportedly has a self-timer. Other minor changes are visible: a shutter lock is added around the release button, the back latch and the bayonet attachments have a slightly different shape, there is an additional pressure spring inside the back for the take-up spool, and a small hump behind the exposure counter activation button. All the examples observed so far with the Seikosha-SLV have the company name TOKYO OPTICAL CO. and no logo on the hood. At least one source mentions a metered Primo Jr with Seikosha-SLV, but its existence is unconfirmed. The body numbers are normally in the 26xxxx, 27xxxx or 28xxxx range for the meterless model with Seikosha-MXL, including the grey edition and the Sawyer's Mark IV. The camera pictured in the user manual has body no.260016 and taking lens no.26001x; this is a hint that the number sequence started at 260001. The highest body number reported so far in this sequence is 2860xx, giving a rough estimate of 27,000 examples. The body numbers of the metered Primo Jr are in the 25xxxx range, even if this model was released after the standard one. The highest body number seen so far is 253371, giving a rough production estimate of 4,000. The lenses were shared with the meterless model, with numbers in the 27xxxx range. The Primo Jr with Seikosha-SLV have a body number and lens numbers in the 36xxxx range, indicating a new production batch. The highest body number reported so far is 364423, for a rough production estimate of 5,000 units. Some meterless Primo Jr are reported with a body number in the 365xxx range, lens numbers in the 27xxxx range, a Seikosha-MXL shutter and all the features of the early models. It looks like the company used an old stock of parts to assemble a last batch of cameras, numbered in the 36xxxx sequence even if they have none of its features. Another possibility would be that new nameplates with new serial numbers were mounted on some older cameras repaired by the company. Primo Jr no.365249, Topcor 6cm f/2.8 taking lens no.27xxxx, Toko 6cm f/2.8 viewing lens no.27xxxx, Seikosha-MXL shutter, no meter. This example perhaps belongs to the last camera batch. ↑ Kokusan kamera no rekishi, pp.399 and 410. ↑ Advertisements dated May 1959 and July 1960 reproduced in Kokusan kamera no rekishi, p.274. This page of hiro's website reproduces a patent by Tōkyō Kōgaku submitted in December 1952 and published in September 1955, concerning the production of a Fresnel lens. ↑ Instruction manual reproduced here at butkus.org. ↑ McKeown, p.924, says that the version with Seikosha-MXL has no Light-Value system, but this is a mistake. ↑ Number of elements: instruction manual reproduced here at butkus.org. ↑ Accessory pictured in this page of hiro's website. ↑ Kokusan kamera no rekishi, p.399. ↑ 8.0 8.1 In Sugiyama, items 2223–4, the version with Seikosha-MXL is called "Primo-Jr. I" and the version with Seikosha-SLV is called "Primo-Jr. II". It seems that these designations were never officially used and were invented by the authors of the book. The name "Primo Jr. II" is repeated in McKeown, p.924, certainly after Sugiyama. ↑ 9.0 9.1 Advertisement reproduced in Kokusan kamera no rekishi, p.274. ↑ Copy of an advertisement observed in an online auction. ↑ Compare the example pictured in this page at Aya's Camera (with no marking inside the back) and the example pictured here by the Topcon Club (with a marking inside the back). The grey example formerly pictured by the 44 Club website has no marking inside the back either. ↑ See this page at hiro's website. See also the very early example pictured in this page at Aya's Camera, with taking lens no.26004x. ↑ Example formerly pictured in a page of SF World of Photos website, and examples reported in this table at hiro's website. ↑ See this page of hiro's website for a comparison of brownish and black depth-of-field plates. The brown depth-of-field plates seen so far have an irregular finish, and the colour might be caused by the rub of the fingers. ↑ See this page and this page of hiro's website. ↑ See this page of hiro's website. According to this table of the same website and to an example observed in an online auction, the transition occurred between body no.2820xx and 284494. ↑ Examples pictured here at Chronofile. No grey example has yet been observed outside Japan. ↑ The lens hood is pictured in this post of the Topcon Club forum (archived). ↑ Example pictured in this page at Damu kikō. ↑ McKeown, p.870, lists a version of the Sawyer's Mark IV with a Seikosha-SLV, but this seems to be a mistake. ↑ TOKYO OPTICAL CO.: example pictured here (archived) at SF World of Photos, example pictured here at Camera Collection Minorhouse, and example observed for sale at a dealer. ↑ Instruction manual reproduced in this page at onetwoseven.org.uk. ↑ Advertisement reproduced in Kokusan kamera no rekishi, p.274. ↑ Self-timer: this page of hiro's website. ↑ Antonetto and Russo, p.31. ↑ Number reported in this table at hiro's website. ↑ See here at Artfact (archived). ↑ Example reported here at Frugal Photographer (archived): body no.365151, taking lens no.279229 and viewing lens no.275397. Example observed in an online auction: body no.365249 reported, taking lens no.2747x4, viewing lens no.2739x2. Antonetto, M. and Russo, C. Topcon Story. Lugano: Nassa Watch Gallery, 1997. ISBN 88-87161-00-3. Pp.31–2. Asahi Camera (アサヒカメラ) editorial staff. Shōwa 10–40nen kōkoku ni miru kokusan kamera no rekishi (昭和10–40年広告にみる国産カメラの歴史, Japanese camera history as seen in advertisements, 1935–1965). Tokyo: Asahi Shinbunsha, 1994. ISBN 4-02-330312-7. Items 1511–2. Lewis, Gordon, ed. The History of the Japanese Camera. Rochester, N.Y.: George Eastman House, International Museum of Photography & Film, 1991. ISBN 0-935398-17-1 (paper), 0-935398-16-3 (hard). P.98. McKeown, James M. and Joan C. McKeown's Price Guide to Antique and Classic Cameras, 12th Edition, 2005-2006. USA, Centennial Photo Service, 2004. ISBN 0-931838-40-1 (hardcover). ISBN 0-931838-41-X (softcover). Pp.870 and 924. Sugiyama, Kōichi (杉山浩一); Naoi, Hiroaki (直井浩明); Bullock, John R. The Collector's Guide to Japanese Cameras. 国産カメラ図鑑 (Kokusan kamera zukan). Tokyo: Asahi Sonorama, 1985. ISBN 4-257-03187-5. Items 2223–4 and 2254. Watakushi no ni-gan-refu kamera-ten (私の二眼レフカメラ展, Exhibition of twin lens reflex cameras). Tokyo: JCII Camera Museum, 1992. (Exhibition catalogue, no ISBN number.) P.31. This page was last edited on 21 March 2019, at 23:23.